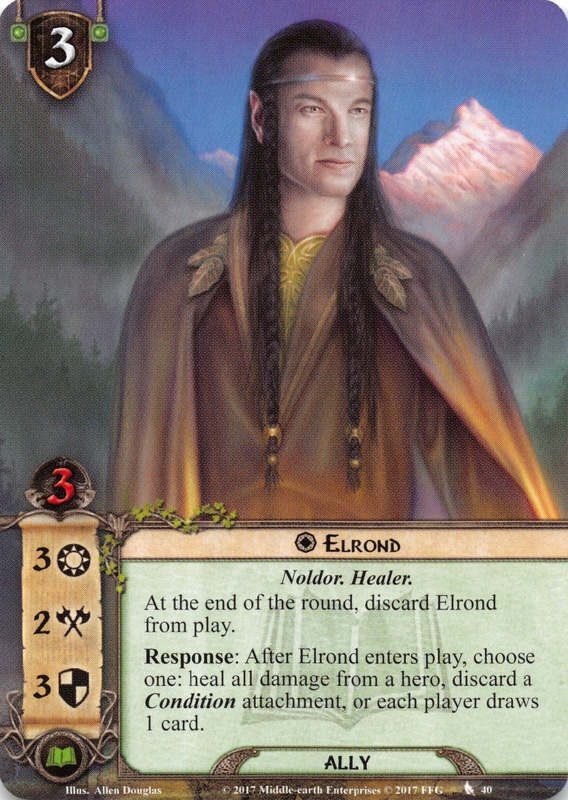 Elrond (b. F.A. 532) was the Lord of Rivendell and keeper of the great elven ring Vilya. Elrond was separated from his wife when she was taken by Orcs; their sons rescued her but Elrond was unable to heal her. She had to leave for the West in 2510. Elrond named Aragorn Estel ('Hope') and concealed his heritage from him until he came of age. When Aragorn became an adult, Elrond gave him the Ring of Barahir and the shards of Narsil, foreseeing that Aragorn might be the one to claim the thrones of Gondor and Arnor. When Aragorn fell in love with Arwen, Elrond revealed to him that Arwen shared the choice of the Half-elven, and that one or the other of them would ultimately be parted from her forever. Elrond insisted that Arwen could not marry Aragorn until he became king of both Gondor and Arnor. In T.A. 2941 Elrond welcomed Thorin and Company into his home, the Last Homely House before the wild, in Rivendell. On midsummer eve - the night before the Dwarves, Bilbo, and Gandalf continued on their journey eastward - Elrond examined the swords which they had found in the trolls' cave. He read the runes and revealed that Thorin's sword was called Orcrist, the 'Goblin-cleaver', and that Gandalf sword was named Glamdring, the 'Foe-hammer'. He told them that they were Elven swords from the ancient city of Gondolin, long ago destroyed. He then looked at Thrór's Map and found that there were moon-letters. From the moon of that midsummer eve he could read the words, 'five feet high the door and three may walk abreast'; and 'stand by the grey stone when the thrush knocks and the setting sun with the last light of Durin's Day will shine upon the keyhole'. This information proved vital for Bilbo and the Dwarves to enter the Lonely Mountain through its secret entrance. 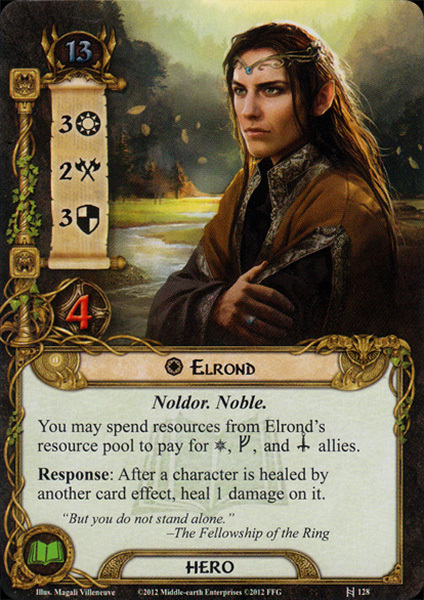 The name Elrond (S, pron. 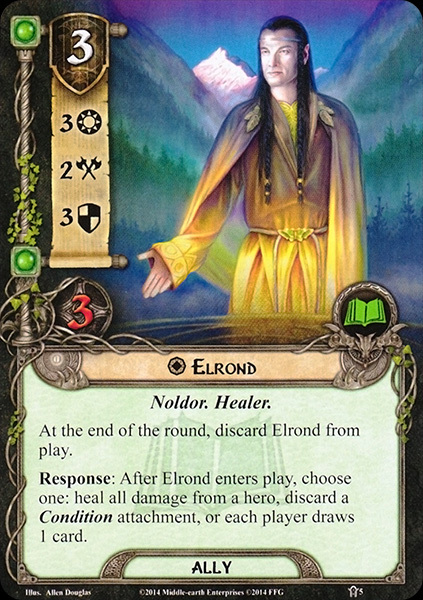 [ˈelrond]) has been translated as 'Star-dome', and 'Vault of Heaven' recalling the glory of Menegroth though at an earlier stage, it was supposed to mean 'Elf of the Cave'. 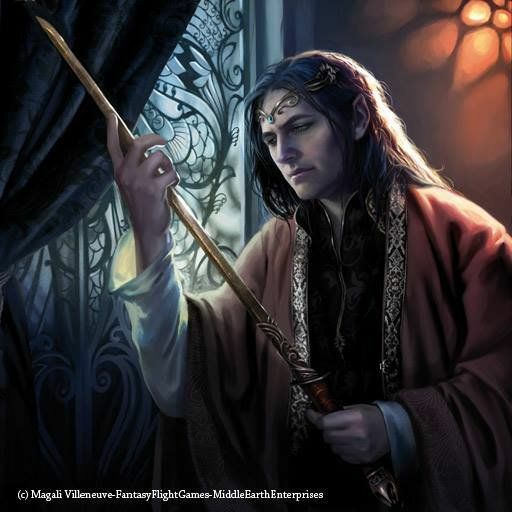 His Quenya name was most likely Elerondo, isolated from the patronymic Elerondiel, 'daughter of Elrond'.